If you were to ask most people “what is dementia?” they would probably say “Alzheimers”. To a point that is true; Dementia is caused by a number of diseases that affect the brain, the most common of which is Alzheimer’s Disease. Different types of dementia affect the brain at different rates and in different ways, but other things like someone’s personal circumstances, the people around them and the environment in which they live, will also affect their experience of dementia in a way that is unique to each individual. Although mainly found within the over sixty fives, it is not exclusively an old persons disease and younger people, as young as thirty, may also be diagnosed with dementia. Dementia often starts with short-term memory loss but it can also affect the way that people think, speak and do things. People with dementia can become confused; find it difficult to communicate, as they can’t remember the words that they want, and can have difficulties planning. People with dementia can feel sad, frightened, frustrated or angry about what is happening to them. However, with a helping hand, people living with dementia can still enjoy life, have good relationships with partners and friends and live independently for longer. People are often happier if they can live independently in their own homes for longer. Dementia friendly communities are villages, towns and cities where more people understand dementia, where there is less fear and avoidance, and people living with dementia are included and supported to live independently for longer. The Tonbridge & Malling Borough Council, Kent County Council and Tonbridge Town Team are working with a group of willing volunteers from different sections of our community to make Tonbridge Dementia friendly. 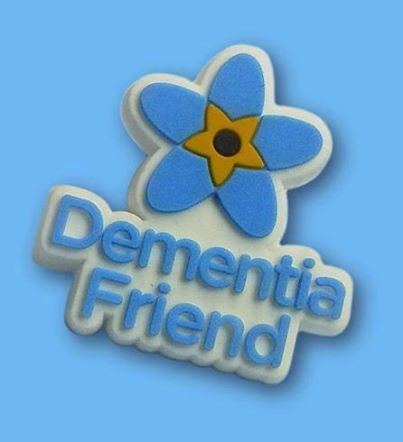 By March next year, 2016, we would like to see at least one hundred businesses, places of worship and public places showing a ‘Dementia Friends’ symbol. One day it may be you, or somebody you love who needs the support of their community. The Dementia Friendly Tonbridge initiative will help to turn our town into a dementia friendly community. During the next year Dementia Friends Information sessions will be held all around town. They take one hour and your only commitment is to take one positive action which may be as simple as posting something on social media to say you are a ‘Dementia Friend’ or deciding that you will be more patient and understanding with a customer who is a bit confused. It is not about befriending, volunteering or fundraising, although you can do all of those things of you want to. Watch out for the posters around town or visit the Dementia Friends web site http://www.dementiafriends.org.uk to find an awareness session near you. Brilliant scheme! Hope it goes well. Thank you. Going well so far.